It happens to the worst of us. 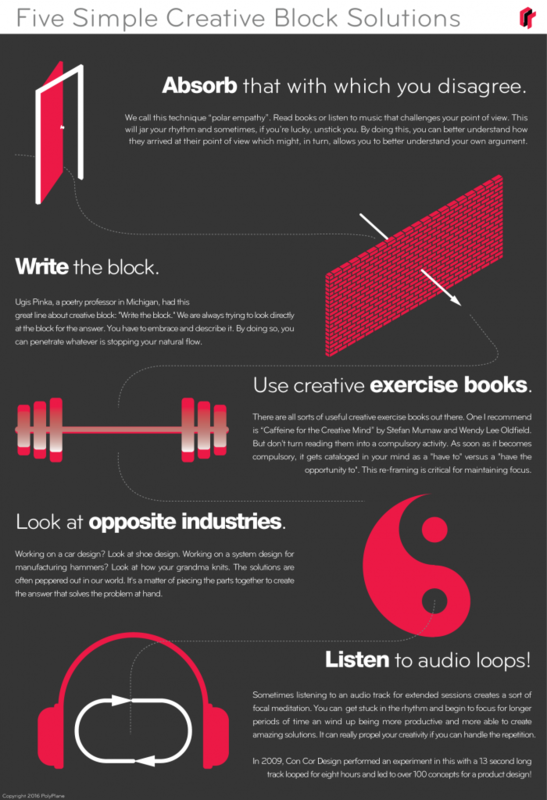 Creative block or writer’s block is one of the more dreaded things that designers have to deal with on occasion. I’ve come across plenty of sites that offer tools and techniques that offer resolve, but none seem to be as steadfast as the techniques that we’ve developed over at CCD. Here are the five best solutions that we’ve come across. With polar empathy it is a great technique to walk through the door of the other side of your argument (problem statement) and decide was is causing it and then you will have a better guess of how to correct this. The old saying of, “If you don’t understand your opponent’s argument, you don’t understand your own” is a great one. It also applies to design problems. If you don’t understand your problem statement, there is no way you are going to understand the solution. Take in the problem and really live with it. This is easiest with tangible goods. For instance, if you are dealing with a problem of designing a door that solves the problem statement: “It is hard for me to open the door with full hands.” You can take that exact scenario and figure out what if feels like to have arms full of groceries and try to open your door. This will give you a better peek into the solution. Sometimes, in writing, an author will stop being able to produce words. There is a great analogy for this that Alan Watts came up with that differentiates “spotlight” with “flood light”. When we try and write around a creative block, we are at a loss, because we can’t see what we’re trying to create around. By describing the block itself, you can penetrate through. Sometimes it is a block that needs to be looked at with a relaxed mind that can sit back and give it a name. Caffeine for the Creative Mind: 250 Exercises to Wake Up Your Brain is a great book to give your brain a boost. Essentially, doing creative warm up exercises, (even when you’re already in the creative process) can help you navigate creative blocks by getting you to refocus on a new creative challenge that freshens your perspective. A great analog version that I came across recently with this was at the climbing gym. I was stuck on this route that I just couldn’t seem to get up. I spent about 45 minutes trying and trying and falling and trying and falling. Eventually, I decided that if I walked away and went to a different problem and then come back, I could look at the problem with fresh eyes. By doing that I solved the route and was able to ascend the wall. Sometimes, innovation comes from the most random places. 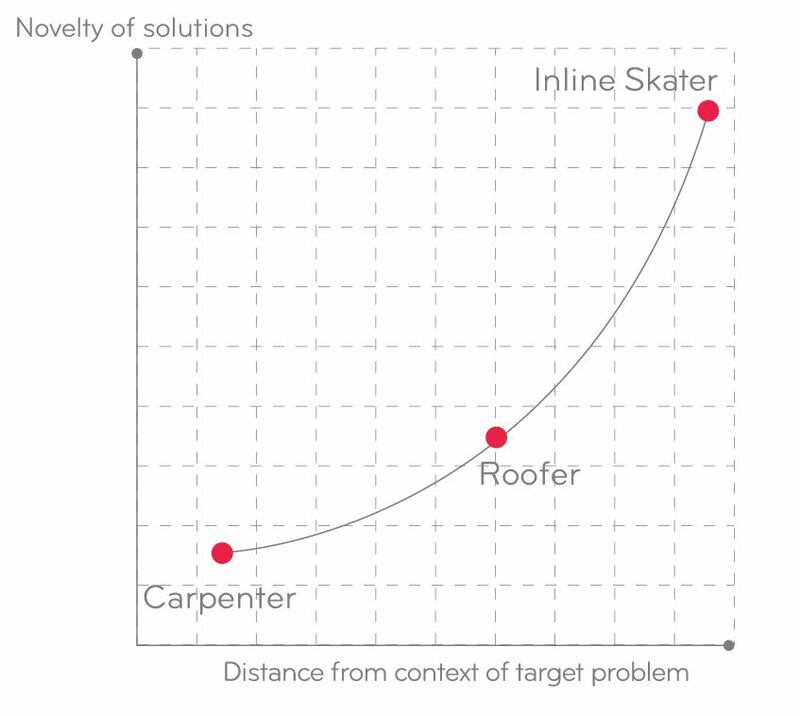 HBR did a great study of the novelty of solutions as it related to the proximity of the context of the target problem. When you look at industries that are less analogous to the one you are solving for, you can create novel solutions that you wouldn’t otherwise see. This is due to the curse of knowledge. Essentially blinders to the solution. Not knowing what isn’t possible is one of the most powerful ways to get things done. Hindus are probably one of the earliest adopters of using this technique to put themselves into a state of deep focus. A mantra is a repeated sound, icon, phrase or utterance that the practitioners of believe give them a psychological edge. This makes a lot of sense considering every other system in your body is using rhythm to time the functions that are critical to life. bah-bump…bah-bump….bah-bump… Your heart, lungs, brain, etc. are all using rhythmic timing to keep you alive and functioning. Using audio to keep your focus is a great latchkey to this system. If you have the ability and patience to listen to short 30-45 second loops, you can put yourself into deep focus to solve your problems. In 2009, we used this technique with a 13 second loop of a pleasant guitar loop for 8 hours and were able to generate 100 concepts for a project in the process. Amazing!